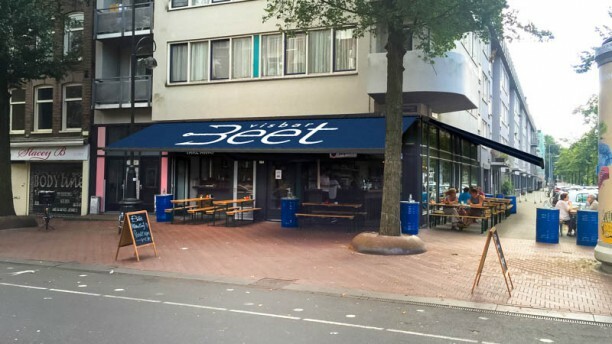 in Amsterdam you eat affordable, quality, sustainable fish at Visbar Beet. Majority of the fish is caught along the European coast. Take away or a nice evening in their restaurant? Both is possible as this place fills the gap between a fish stall and luxury restaurant. The decor is characterised by hanging plants, velvet blue and wood. Excellent and tasty seafood; great Chef! This is mainly a seafood place. Most of the dishes are of tapas style, though we did get a whole sea bass, which was excellent. The smaller dishes were wonderful also. Het was smullen van de eerste tot de laatste hap met een uistekende service. Excellent food, friendly service, nice place! Thanks a lot!!! An extremely inexperienced waiter really marred the experience for me. Not only was he new to this restaurant, he seemed to lack any experience of being a server at all. He didn't know there was a green salad on the menu and looked at me skeptically when I tried to order it. He was unable to answer even the most simple question. A more experienced server would have known to steer me away from a dish I was hesitating about and ordered, only to hate it and feel the expensive meal was ruined as a result- the razor clams. The other man working, who seemed to be a proprietor, was very knowledgeable and friendly. I feel everything would have gone differently if he had been the server. I loved the industrial combined with green plants decor. Really loved it! Food is tasty and very good, and the service, combined with a nice atmosphere, made the evening just perfect. I will definitely go back to try all other dished I couldn't have this time. Give it a try, you won't be disappointed. This is a little hidden gem in Amsterdam Oost. This cute little restaurant possesses a charming setting, complemented by an attentive and friendly service. The food is amazing, with the fish being clearly fresh and prepared with care as well as innovation when it comes to flavours and textures. There's also an eye for the mise-en-place, which was a welcomed plus. The wine selection is optimal in both quality and variety. I just wasn't crazy about the Calamares, though it didn't spoil the dining experience. I will totally be back. They were great with us! it was our second time there and we loved it, very conveniently situated not too far from the Brouwerij 't Ij, we will most likely be back for a third one. Thank you for your patience with my "intermediate" dutch! I really appreciated it. Dear gorka, Thank you for the good review. We hope to sea you soon for a third one! The service is great. The location is perfect with a great terrace overlooking dappermarkt. Try the Portuguese wine, ceviche and grillled shrimp. Skip the saltimboca. You can not go to Amsterdam without having dinner at the Visbar Beet. If you love fish "visbar beet" is a paradise of taste. Fresh fish cooked with skill and balanced aromas. Nothing is left to chance, even the presentation of dishes is adequate. restaurant, furnished in shabby chic style, is small and cozy.The service is polite and attentive.Excellent fish tartare, herring and roast seabass. All good.The price is right and the bill will leave a smile. Very friendly service. Highly recommended. Owner made special effort. Loved the hot drinks, starters and main. Nice place with a very friendly staff and good food. We shared a cold and a fried fish platter and were happy with our choices. The seafood bisque was tasty but disappointing because it was watery, The oysters and small Japanese salad were fabulous. We were also very impressed by the desserts. The one rose wine on the menu was also one of the best we've had in a long time. Definitely worth a return visit. Lovely atmosphere, amazing food and good wine! I will definitely go back. I will definitely go back. I will definitely go back. A wonderful evening with amazing fish cooked to perfection. They love what they're doing here and you can feel and taste that. A wondeful discovery. Loved the food: the oysters washed down with seaweed- infused jenever were excellent. The Verdejo was, sadly, forgettable. Relaxed but fun atmosphere, incredibly fresh fish cooked excellently and great service to top it off. Service could have been better. the food is good. I had the salad with fish and the shrimps - were very tasty, recommended.